After years of using Raymarine equipment, we had great difficulty in getting used to the "Furuno way of thinking". It was only after much reading of the manuals that we have, in time, become better acquainted with our new electronics (although there are always the regular quick dashes to the instruction books to find some function we don't use regularly as nothing is logical, in my humble mind). Another thing we discovered, but Furuno claims it is not their fault, is that the electronic charts we now use don't seem as good as the Navionics ones in our previous Raymarine C90W plotters on the HR37 & 43. Charts "jump" on the seams between two areas that were put together, and during our 2016 summer cruise we sailed twice by the Calshot Spit float - a major buoy in The Solent - and did not see it on our e-chart!!! We took pictures of this incident and queried our mapmakers, who nodded and admitted that they get their chart material from C-Maps. And if C-Maps isn't correct, then our Mapmedia charts for the Furuno can't be up to date. It does make you wonder what was scanned and what wasn't... Passing Calshot Spit again in 2018, we noticed an improvement: at least the buoy's name came up on the plotter, even if the buoy itself still didn't!!! 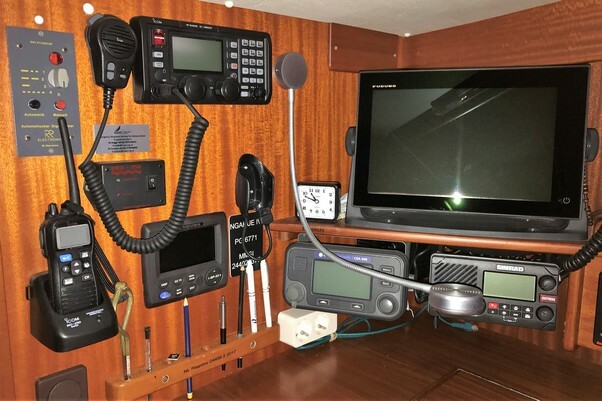 Pictured here is the boat's navigation corner as it was during the 2018/19 winter lay-up (hence the drapes visible in the background): it is getting quite busy with all the new gear now installed, including the ICOM M-802 SSB. In August 2018, we removed a Fastnet 55 Radio receiver and a Furuno weatherfax machine situated on the wall behind the navigator's seat and used the place to put our Iridium phone handset. The original place for the handset was in 2018 taken up by the ICOM SSB!! > the active aerial for the Navtex not giving any usable signal! All of this is hardly an advertisement for Furuno reliability...to say nothing of their (in our case at least) very questionable customer service! Ngahue IV has two separate autopilots in case one should break down. Both actually broke en route to Lanzarote in the summer of 2017. When we bought the boat, she had a single Raymarine SG3 course computer that directed a double Simrad-Robertson hydraulic set of rams configured as push-pull on the rudder quadrant. We wished to add a second autopilot and were advised to install a new Furuno course computer which was to drive a Lewmar 1/4HP Mamba drive. During the refit period in Kiel in April 2016, the Mamba drive didn't arrive on time. As a stop-gap measure, the new Furuno course computer was (temporarily) linked to the Simrad-Robertson hydraulic linear drives (which apparently are extremely powerful). It took the Furuno course computer some time to "learn" about the boat and initially the wheel in the cockpit swung madly and dangerously from left to right while the Furuno unit was looking for the right setting!! The Mamba drive, when it finally arrived, was connected with the Furuno. But it quickly generated several fatal error messages and needed to be reset. The Furuno was then re-connected to the hydraulic drives again, and the wildly swinging steering wheel continued. In order to keep the swinging under control, we fitted a couple of bungee cords (see photo), which seemed to work quite well, even if it was a bit of a strange set-up. 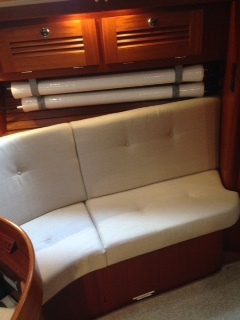 Several months later, the Furuno had "auto-learned" enough for us to remove the bungee cords... The Mamba fits on to our Whitlock steering system (see more below) at a steering system junction box in the engine room. This is a pretty standard Hallberg-Rassy set-up. The Mamba was subsequently linked to the old Raymarine course computer. After many testing sessions and a few extra repairs, we seemed, by the time of our departure in the summer of 2017, to have found some more or less acceptable settings on the Furuno whereby the Simrad-Robertson hydraulic drives no longer swung the wheel too wildly from port to starboard, and the Mamba drive didn't feed electro-magnetic information back to the course computer which then went into "fail" mode... In early 2017, unfortunately, we never got round to properly testing out auto-pilot drives for long-term reliability. We were quite dismayed, therefore, that during our trip down to the Canary Islands one autopilot after the other failed in mid-sea. Actually it was a salutary experience to have to sail our boat manually as we discovered that a) it could be done; and b) it was not as exhausting as we had feared. In fact, the boat steered very nicely and very lightly! When the boat was in Lanzarote, we reviewed both autopilots critically and prepared new back-up spare parts so as to avoid repeats! 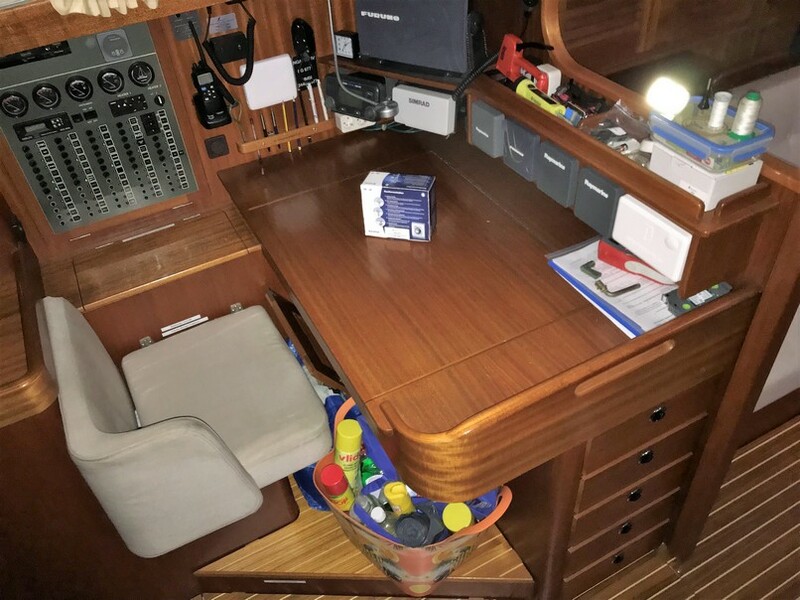 Some issues have remained, and the Simrad Robertson hydraulics again broke a connecting pin near Bonaire in the Caribbean! During the winter 2018/19 refit, we solved this particular issue very neatly by removing the bronze rudder fitting to which the Simrad-Robertson drives are connected, and to have it machined and improved by Dirk Roegiest of Deurne. We now have stronger connector pins (14mm hardened steel instead of 12mm stainless. The better Raymarine autopilots that were installed in August 2018 (see below) and the stronger connector solution from Mr Roegiest should see us cross the Atlantic and the globe in full confidence that our steering is now perfectly OK! Our final conclusion has been that the FURUNO course computer and autopilot IS JUST NOT SUITED to our purposes or to our boat. In truth, we even felt that the Furuno Autopilot was a DANGEROUS piece of kit to have on board as we were NEVER CONFIDENT in its proper functioning! We were keeping a constant watch on what it was doing, so that instead of relaxing because the autopilot was steering the boat and acting as third crew member, it was soaking up our attention and tiring us out! In the summer of 2018, we had both old Autopilots removed and replaced with a pair of new Raymarine Evolution EV-400 Autopilots. These steer the boat quietly, confidently and ever so gently! Our favourite boat electronics people, Maricom at Swanwick marina installed two completely separate and independent autopilot systems: Autopilot-1 and Autopilot-2. N° 1 is our main pilot as it uses the Simrad-Robertson hydraulic drives; N° 2 uses the Mamba drive to steer the boat. You switch from one pilot to the other with a simple switch on the steering pedestal. There is a 5 second delay as screens go black and the other pilot comes on line. Both pilots received vital navigational data deom the remaining Furuno equipment via a data bridge. Compared to the Furuno information displayed, there is just one line missing on the plotter, namely the current fixed heading line; you do retain, as with the Furuno pilot, the general heading of the boat as corrected and adapted all the time by the autopilot. Perhaps in close coastal sailing one would want the peace of mind offered by that straight line of the fixed heading. But as the Furuno pilot wandered 30-40° off course in all directions, that fixed line was a bit of a joke anyway. There are control units for the Raymarine autopilots at the steering pedestal and at the inside chart-table. The Smartpilot remote control will operate the pilot that is active at the time. The new system works perfectly, and our stress levels have returned to normal - the way it should be! Our conclusion is that Furuno Autopilots are not made for (our) sailing boat(s); Raymarine Autopilots are. Furuno makes good radars, although the latest Raymarine units certainly give Furuno a run for their money. For other navigational equipment, any brand will do. Perhaps it was just our bad luck, but EVERY individual Furuno instrument on board has broken down or displayed one or several quite severe faults: log, odometer, depth, wind instrument, water thermometer, Navtex. Even the plastic holder of the GPS aerial rusts! Our experience with Furuno Customer service has been quite appalling too... The company simply ignores you and hopes you will go away, or promises to do something which then never materialises either. In short, WE ARE NOT FURUNO FANS ANY MORE!!! In 1995, Hallberg-Rassy fitted out our boat with a Whitlock Mamba steering system. That was a long time ago, and the Whitlock brand/company has since been bought up by Lewmar. Unfortunately, information on early steering systems is very hard to come by, as are the people who know something about them. The documentation that was supplied with our boat was in part irrelevant, and on several points quite unclear as to what should be done to the system… After some trawling on Internet, we found Cliff Mogridge of Whitlock steering who proved to be helpful with designs and information on our steering system. Cliff used to work for Whitlock and Lewmar. Unfortunately, he never responded to our fervent request that he come on boat during 2018 summer to look at, and service our steering. A pity! Mechanically speaking, Whitlock systems are pretty simple and extremely robust. They do require regular maintenance, but can take large amounts of abuse before actually failing. The various components are: the steering wheel, the pedestal mechanism and a gearbox; a bevel-head and gearbox in the engine room (this box also has a splined shaft sticking out which allows you to simply fit the 24V quarter-HP Mamba drive on to), and a draglink just next to the rudder quadrant. These components are inter-connected with solid stainless steel rods and two sets of universal joints to get round angles in the engine room and under the aft-cabin bed. 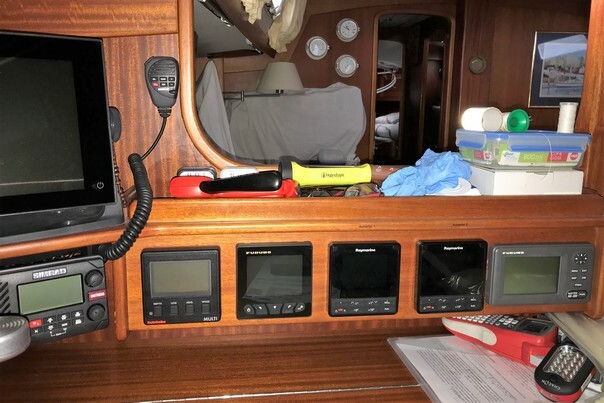 > A SIMRAD RS35 Class A unit as our principal VHF - situated at the chart table, with a wireless extra handset for use in the cockpit (installed in August 2018). > Iridium Pilot satellite phone (or IOP - Iridium Open Port) and Internet communication unit, with an on-board Netgear WiFi hub which links this external communication with our computers & iPad. We have two dedicated laptops (an HP Pavilion and a Durabook laptop, both specifically suited and programmed for our communication needs. One has a solid state hard disk, operates under Windows 7, and has all possible automatic downloads switched off to minimise the risk of unwanted downloads at costly Iridium dollars. The other is a doctored laptop that operates on Windows 10 (we've had this one "throttled" and "muzzled" so that it doesn't - unless given express permission - chatter with the world via Iridium at $10 per Mb) and offers nearly a Terabyte of hard disk space. It has been specially protected to conform to military standards of robustness. Our Iridium airtime provider is the AST Group. We were particularly displeased with them when they cut off our SIM card mid-Atlantic, apparently because a programme called Google Marketplace (we didn't even know this programme existed) had downloaded multiple tens of Megabytes and exceeded our monthly quotum several times over! We have established new and better rules with AST so as to avoid such a thing happening again, as we felt it was completely unacceptable to be without any communication with the outside world for more than a fortnight! No met information, no medical comms, no chats to family who were worried sick! We had a second run-in with AST in Tortola, where we spent a lot of time with them , as we were experiencing difficulties with the "voice" side of our Iridium. Probably the only problem was that after the hurricanes of 2017, the telecom companies in Tortola were heavily using very powerful satellite communications as most landlines were dead and that these were interfering with the much weaker Iridium signals. Once out of BVI, our Iridium Pilot set was working perfectly again! AST, who had at a distance determined that our aerial was definitively defective and no longer under guarantee because of a faulty installation, concluded, after full testing later in the UK, that the aerial was prefectly OK! We have adapted the set-up of our aerials at the back of the boat and the Iridium aerial now sits higher than anything else. According to AST, our installation is now OK and with the properly-working aerial things have been fine since. We fervently hope this stays the same and have made our peace with AST. > As an Iridium back-up we have an additional Iridium 9555 h/h phone with airtime bought from another service provider, so that we are not dependent on AST alone (once bitten, twice shy)! The radio, television & Navtex equipment are all connected to our very sophisticated RR Pacific aerial in the mast; the many 'boxes' with the antenna's outputs near the chart table look very impressive and when we finally got our television connected to the TV-output, we were astonished by the plethora of signals out there. In addition to our normal shorepower charging ability, the boat has a set of two small Photonic panels as well as two flexible Solbian SP 125 & two SP 130 solar panels, regulated by a Victron 100/50 MPPT regulator. This should yield some 600 watts of solar electricity when the sun shines directly onto the panels. 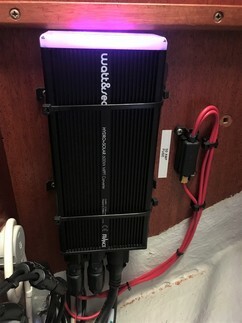 In addition there is a Watt & Sea 600W water generator (the small Photonic panels are connected to the smart regulator that came with the Watt & Sea). 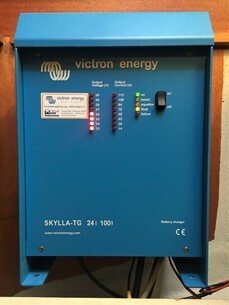 The Solbians are connected to their own Victron smart MPPT regulator, which has a display showing exactly how much electricity they are producing. Finally, Ngahue IV has a very solid Westerbeke 6kW (220V) generator installed in 1995 by Hallberg-Rassy. (see photos of the psychedelic Watt & Sea regulator sited under the seating in the aft cabin, and the Westerbeke in its red soundshield). When operating, the Westerbeke generator is relatively silent outside the boat and only really audible inside her in the aft area. It is used mainly for feeding the watermaker and the washing machine with AC; these are the major 230V users and they require significant quantities of power. Unfortunately, when the Yard installed the generator, they certainly did so in an aesthetically pleasing, but perhaps not totally practical manner... To explain, the cooling system often ended up with airlocks in it because of the long circuit that the cooling water needed to follow. Furthermore, the hose dips down and comes back up again, and offers ideal opportunities for airlocks to form everywhere... In the 2018/19 winter lay-up, we've had to have the circuit relaid, considerably shortened, and added a dedicated seawater entry point for the generator. It previously shared a seacock & filter pot with the freezer, toilet and watermaker. Westerbeeke doesn't disapprove of this, but suggests not sharing inlets with other users as it is not quite ideal. Well, that point has been remedied. During the first Atlantic circuit part of our circumnavigation we had lots of problems with the generator (as everyone seems to have). This led us to increasingly question the reliability of our Westerbeke (referred to as Wester-break by a charter company manager where we were moored at the time); we felt that the unit would be best completely replaced by a modern Whispergen one... A patient and conscientious engineer in BVI looked at the Westerbeke and found that previous maintenance had not been done properly, e.g. the seawaterpump had been mercilessly hammered and bolted into the engine block so that the pump axel and impeller were misaligned (see photo) and led to early failure of our impellers. The exhaust elbow also failed to allow for a free flow of cooling water into the exhaust system. All of this had been hidden by the fact that the cooling water of the Westerbeke is normally - on our boat - directed BELOW the waterline. Although less friendly to the ear, we have now redirected the water flow through the normal exhaust ABOVE the waterline, which allows you to see whether there is a clean flow of water coming out of the exhaust. Yes, this set-up could lead to a pressure build-up in the exhaust, which isn't good. But the Westerbeke is a sufficiently big engine for this not to be a problem. The new seawater pump and exhaust elbow have transformed our Westerbeke into a much more reliable machine. We have also added a Blue Sea Systems M2 1838 AC multimeter to electronically monitor the electricity produced, both by shorepower and more importantly by the generator. That way we can see immediately whether the electricity-generating side of the generator is operating properly. And so, for the time being, we have decided to stay with our Westerbeke. It's only done some 800 Hours, which for this type of generator (generally designed for some 2000 hours, apparently) is quite low, with lots of margin left. On the solar front, we started off having just two high-performance Solbian SP125 black contact flexible solar panels that we simply "velcroed" to the bimini. Whether the boat is at anchor or sailing, these two panels potentially generate 250-plus watts at 24V. We thought that this would be enough to cover our (mainly) refrigeration needs. Already in Belgium, on a sunny day, we found that they easily generated 150 watts; in the tropics, with careful positioning and on a sunny day, they reach approx 225 watts at midday. Our initial experience during our circumnavigation showed that this output was a little inadequate. Therefore, we decided to add another two Solbian SP130 panels to generate a total of 450-500 watts from say 10 a.m. to 4 p.m. each day. 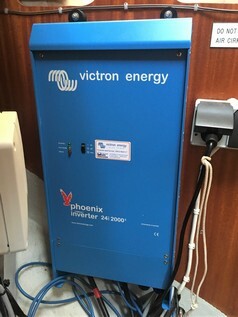 When we doubled the number of solar panels, we of course also needed to upgrade the Victron regulator to their 75/100 model. We also discovered that we needed to adapt the wiring of the 4 Panels as in series they started producing close to 100V: a bit too close to the operating limits of the regulator. By connecting the 4 panels in parallel, the voltage drops to about 45V, and the overall power output reaches the hoped-for 450 watts quite easily. In addition, there are a further two fixed Photonic 50 watt solar panels fitted to the deck, just before the cockpit windscreen. These are wired into the Watt & Sea regulator, which specifically allows for two inputs: one from the water generator and one from an extra 'green' source, in our case these two panels. These two panels do tend to get shadows on them from the boat's superstructure, so their output can drop sometimes. 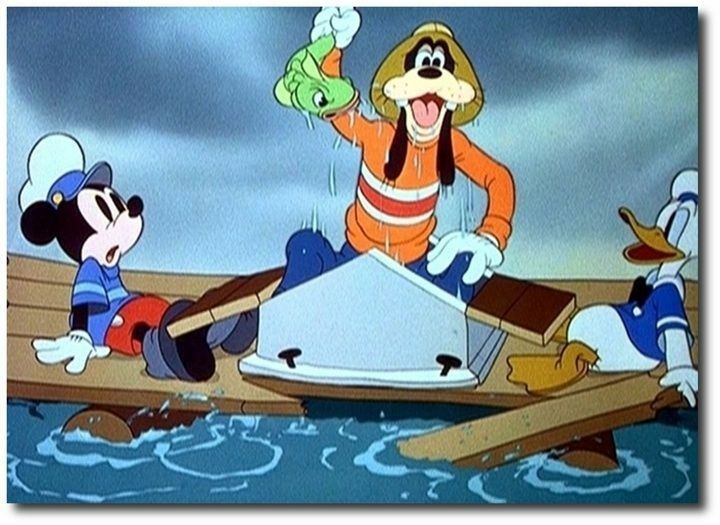 Regarding our hydro-generator, it is of the essence to keep the Watt & Sea well down in the water (at least a foot/30cm in the water), so that the propeller can achieve its full electric outputl. Unfortunately, the HR53 stern comes up quite a bit and despite having the long arm version, our Watt & Sea sometimes exits the water, especially in moderate to rough seas and on a port tack. After our first Atlantic experience we also decided to fit the larger 28cm propellor on our Watt & Sea in order to generate more electricity! Clearly though, the rated 600 watts is only generated by boats that sail much faster than we do and manage to keep the propeller well down in the water all the time. At a rough guess, I'd say our Watt & Sea delivers about a quarter to a third of its stated output (covering probably the fridge and/or freezer needs). Regarding generating electricity with the main engine, our Volvo-Penta TAMD 41B engine was retro-fitted in 2010 with a moderate high-output 24/100 Amp alternator (pictured here). This unit is an American Leece-Neville BSC3014U model. Its output is controlled by a new Sterling Pro-C Digital high performance smart regulator (installed August 2018). When carrying out this improvement, we also wanted to rebuild the Leece-Nevill alternator. Unfortunately, under previous ownership, it had been damaged by seawater dripping on it; the unit couldn't be safely reconditioned and was replaced altogether by its successor model (a dark-black unit). The old unit was serviced though, and now has a place in the boat with the other spres on board. The output from the standard Valeo 12V/60Amp alternator on the Volvo-Penta engine is used to simply charge the engine starter battery bank. 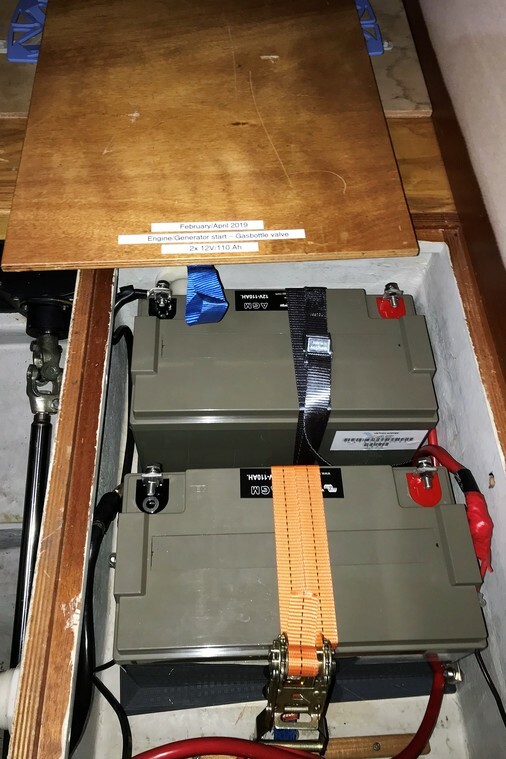 This bank now consists of two Victron AGM 12V/1100Ah units - new from Spring 2019 - and is, as is custom on many larger Hallberg-Rassies, situated under the bed in the aft cabin. This battery bank starts the main engine, the alternator and feeds the 12V Truma gasbottle electric cut-off valve. During the 2018/19 winter refit, we decided to have the standard Valeo alternator rebuilt as its voltage output at low revs was insufficient, which triggered low-voltage alarms (most distressing when manoeuvring the boat around in the harbour using low revs only)! > Odelco Battery Control System DCC 40000 which monitors energy flowing to and from the house battery bank - there is also a Victron instrument showing how many watts our solar panels are generating. 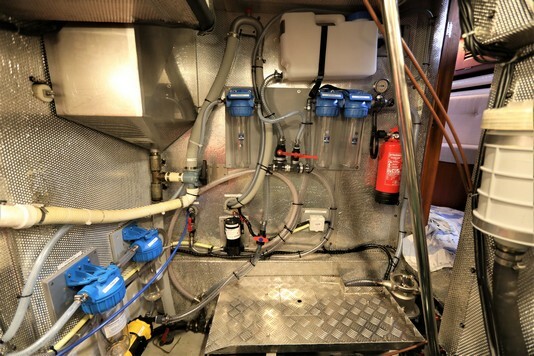 The inverter and generator outputs feed into the boat's wiring via a hefty selector switch (Off/Ship's batteries - Shore-power - Ship's Generator - Inverter; switch renewed in 2017) and thus allows the direct use of the washing machine, the Kenwood bread maker, or the Aquatec watermaker which all operate at 230V. Plus of course any electrical equipment that might be switched on at sea (e.g. vacuum-cleaner). Below you can see pictures of (from left to right) our Victron Battery charger, the Inverter and two of our 6 Victron AGM batteries - 12V/220Ah, that were unfortunately "cooked" by a malfunctioning regulator during two days of non-stop motoring. These are all situated under the double bed in the aft cabin. In the second block underneath, you can see how we have nearly doubled the capacity of our 12 Volt circuit by a much better use of the available space in the battery box. 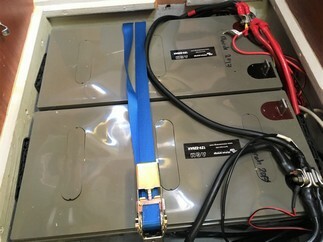 We now have two 12V/110Ah AGM units instead of a single 12V/130Ah battery. As on our previous boats, a lot of thought also went into reducing electricity consumption, e.g. through "LED-ifying" all light-bulbs, and rendering the fridge & freezer cooling systems more efficient. Careful thought has also gone into the boat's electronics, whole parts of which can be switched off whilst ocean sailing, thus conserving energy. With all equipment running, consumption whilst sailing will easily add up to 8-10 amps (at 24V), much of which is normally covered by renewables (our Watt & Sea water generator and our Solbian solar panels). This isn't always the case (see above) because the water generator is not always deep enough in the water, and initially with only 2 Solbians we were on and mostly just under the borderline of self-sufficiency. 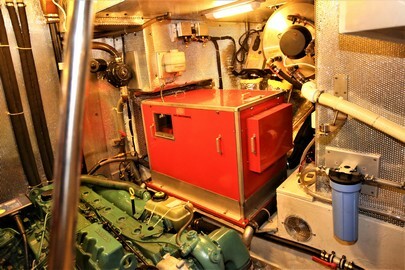 With about 250Ah truly available from the domestic batteries (on the total capacity of 660Ah - we don't like running them to below about 70%), charging cycles at sea should be about once every other day or so (running the generator or the main engine is also useful to make some fresh and some hot water at the same time). When at anchor, we expect our now extended to 6 solar panels (4 big ones/2 little ones) to cover all our energy needs, certainly in the tropics. All our new electrical, communications and electronics that were fitted in May 2017 and again in August 2018 have been installed by Dave Cobb, Paul Olley and Mike Cobb of Maricom. I was first introduced to Dave and Paul in October 2004 by the Hallberg-Rassy UK representative, and have been a happy and loyal customer ever since. Twice now, I have even asked them to come especially to the Netherlands and to Belgium respectively to work on our Ngahues (III & IV). They have a deep insight into what equipment is on the market, and what generally works and what generally breaks down. Their advice - which evolves with what is available on the market - is always to the point and completely neutral. We have systematically followed their advice and rarely been disappointed! A phone call or a text-message have sufficed to put matters right, even for things they had not installed. It would be an understatement to say that we like our Team Maricom! As standard, Hallberg-Rassy 53s have a single stainless steel water tank which holds ±1020ltr of water. It is situated under the floor in the forward part of the saloon. Hot water is provided by a 60 ltr calorifier, which is heated either by the coolant fluid from the engine, or via a 230V heating element. During the 2016/17 refit the tank was internally cleaned out to remove residues that could block the water pump. Ngahue IV has a Jabsco Flojet waterpump that operates without an external pressure tank (it has its own small one added to the pump). On the Yahoo Hallberg-Rassy discussion forum (see Links page) there have been mixed and critical reviews of such a set-up. Most of the time our system works, but the pressure sensor on the pump does indeed occasionally let us down and stops working. We simply switch the pump off and on again at the electricity panel and that seems to prompt it to want to work again. Our boat came with double charcoal filters fitted by the Yard. On the HR53, the previous owner, a man of immense strength in his arms and hands and had tightened them to such an extent that we never succeeded in opening them to replace the filter elements inside. This gave us an excellent excuse to order two new filters from Mellie Rassy at HR Parts. They have been duly fitted! Seen here with the feed pump from the watermaker installed underneath them. Seen here with the feed pump from the watermaker installed underneath them. When looking around for a watermaker for the boat - we wouldn't like to die of thirst in the middle of an ocean surrounded by sea & sand ;-)) - we wanted something that is solid and reliable. Our previous Hallberg-Rassies 37 & 43 both had US-made Spectra watermakers on board; the one on the 37 was owner-installed; the one of the 43 was Yard-fitted. Most watermakers in sailing boats operate with a reverse osmosis process, i.e. pumping seawater through a fine membrane under very high pressure in order to remove salt and other impurities. This system requires a lot of energy and typically discards two to three times the quantity of water produced overboard as a reject-saline solution… After careful consideration, we opted for a technologically relatively simple watermaker produced by the German company Aquatec. Their AC/150 model, which we have chosen, comes in a modular package. The advantage is that this allowed us to spread the various bits and pieces around the aft cabin, the aft heads and part of the engine room. Because all of a sudden you discover how "small" a Hallberg-Rassy 53 really is... Our membranes, for instance, would only fit (and only just) under the two top cupboards hanging over the seat in the aft cabin (see picture; Leon Schulz helpfully suggested mounting the membranes under the saloon settee; but we opted to keep this space for storage of food and spares). In order to get the most efficient and least energy-hungry solution, the watermaker will be running on 230V AC, which will be provided by our Westerbeke generator (see above). Of course this begs the question of our total reliability on this unit to provide and adequate supply of 230V for the watermaker - our inverter is not big enough! DC watermakers are getting much better, and perhaps we should have opted for such a solution. However, the owner of Aquatec, Herr Joachim Matz, with whom we had a loooooooooooooooooong conversation during BOOT Düsseldorf 2016 was quite adamant. So the 220V route was our chosen path... At full throttle the unit produces 150 liters of water per hour and it requires about 10-15 liters of fresh water to flush out the whole system at the end of use. 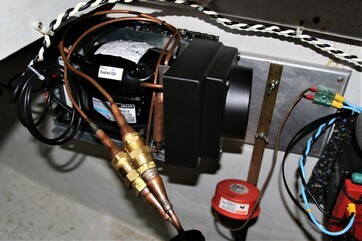 We estimate that the watermaker should be run for an average of about 2 hours every other day. Aquatec watermakers have no electronics in them: in truth, there are only two electric switches as well as two electric motors in the whole system! The individual parts that suffer most from wear and tear (notably the electric pumps) are Belgian and German made and fully tested for an impeccable track record. The galley on Ngahue IV is situated to starboard, as you descend the main hatch and stairs. This is a pretty standard lay-out on many boats, including Hallberg-Rassies. Increasingly though, on the bigger Hallbergs, galleys have been placed in the walk-through to the aft cabin. 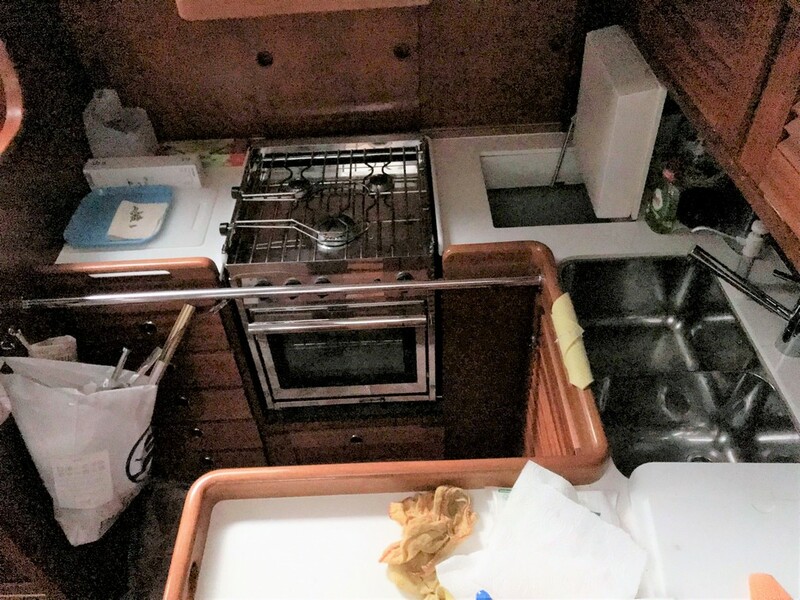 The advantage of our set-up is, we find, that the cook is firmly wedged into a very full U-shaped galley and can work reasonably safely at sea. The cook remains visible to people in the cockpit, and can hand up mugs and plates from the safety of the U-shaped galley. During our first 15,000M sailed with the boat we discovered two issues really. The first issue was the fridge, which is a top-opening unit, set in a corner of the galley. As described in more detail below, we needed to "un-improve" the fridge by stripping out the insalubrious layers of extra insulation that the previous owner had added. We then discovered that the fridge is actually a VERY BIG BOX and that you need long and flexible arms (a cross between a gorilla and an octopus) to be able to reach for the food that is stowed in the lower recesses of it. The second issue was our Force 10 gas cooker. 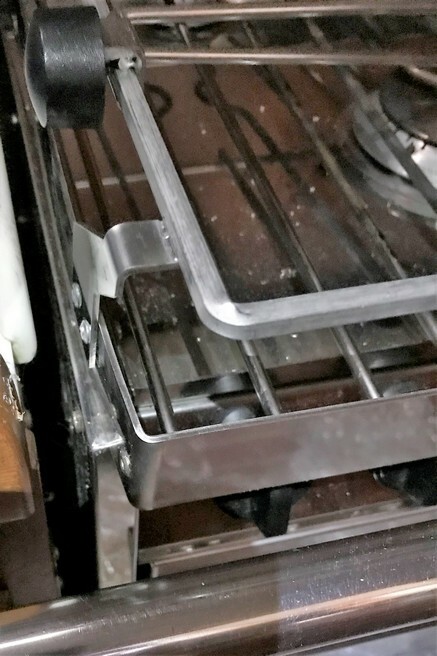 The panholder on it was the wrong design, so that when the cooker swung around in a seaway, the knobs on the panholder knocked against the galley working surface and flew off. 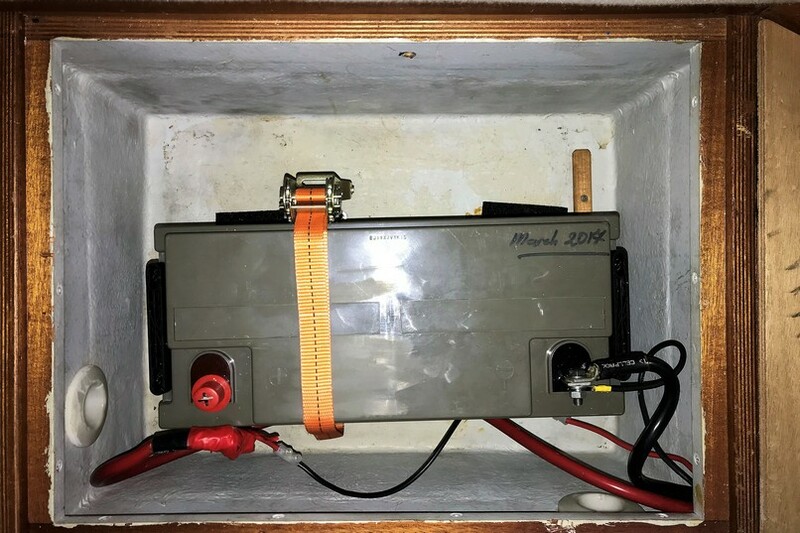 After studying a gas cooker for sale on Tortola, we discovered that another and better designed panholder - one with an off-set built in (see photo below) - was available from Force 10. 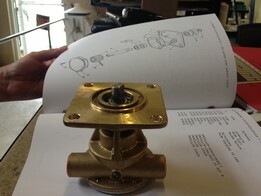 We ordered it and fitted it: problem of flying pots and pans solved! One really wonders why this particular panholder model wasn't fitted on our cooker in the first place. As described on several occasions, the previous owner had "improved" the energy efficiency of the fridge and freezer on Ngahue IV by glueing additional sheets of polystyrene to the walls of the freezer and subsequently glueing sheets of thin perspex over the polystyrene. Referring to the series of pictures below of the "before" situation and you will notice how much space was used up by this method. The series of 4 photos shows the work as we did it in the freezer - and the last photo on the right shows a not much better situation in the fridge. We dread to think what a laboratory analysis of the brown water would have revealed. Instant death, no doubt... And Gordon Ramsay would have closed us down in a wink, as he does sometimes in his Hell in the Kichen programmes. Because the previous owner hadn't sealed the joins between his perspex very well, you can see how water, condensation and general muck had seeped into the bottom of the fridge and freezer. As a result, both smelled really bad. But also, this extra insulation had greatly reduced the space available, especially in the freezer box where only a few bottles for instance could be stood up. Furthermore, the freezer refused to "freeze" below -3°C because the previous owner had also decided to install a Webasto ASU cooling unit; these are quite inappropriate for achieving really cold temperatures in larger freezers. This unit was certainly adequate for the small fridge on my first Hallberg-Rassy 29, but no good in the HR53 freezer box! We removed the extra internal insulation - a messy job - and after sanding down everything to a flat, even and easily cleaning surface, we painted the inside of the fridge with a special beige paint that withstands low temperatures (pictures on the Preparing for the ARC page). Pictured here is the compressor for the fridge which is air-cooled and was placed, by the previous owner, under the floorboards in the saloon area. We have left it there, but removed the compressor for the freezer (part of it just visible to the right in the picture) which was placed next to it as the whole cooling system for the freezer needed to be removed anyway. We now needed to look around for alternatives and after some hunting around, opted for an Indel-Webasto (Isotherm) seawater cooled freezer unit. Interestingly enough, all manufacturers seem to use Danfoss compressors for their fridges and freezers. Our model came with a Danfoss BDF80 compressor and a huge cooling plate (130cm in length) and is called their Magnum range. Furthermore, the compressor is cooled by seawater which is circulated around the compressor thanks to a dedicated water pump. The system is particularly recommended for boats requiring a lot of "cold power" in the tropics - exactly what we need for our freezer around the equator… Fortunately, after looking around the engine room, we found - quite by chance - the original water inlet & outlet for the 1995 Frigoboat cooling system that Hallberg-Rassy had installed for the first owner. We re-used the inlet, which saved me from drilling an extra hole in the boat - always a tricky business... Quite by chance, and some months after installing the new compressor, we discovered that the old hoses from the Frigoboat era were about to burst, which would indeed have sunk the boat, as all these connections are helpfully placed under the waterline! 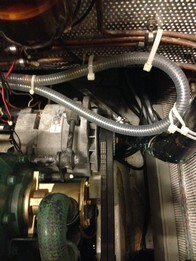 A new hose was quickly fitted and the installation made safe again! Our fridge cooling system has therefore essentially remained unchanged, despite Leon Schulz's advice to change both compressors to Webasto's Magnum range. This is what he has done on his boat, the Regina Laska. Our reasoning is that at the moment, the fridge works too well and even at the highest temperature manages to freeze our vegetables and fruit to pulp and transforms our soft drinks into ice. Our hope that as the fridge volume has increased with the removal of all that internal insulation, the effect of the evaporator will be less, and consequently achieve a "normal" fridge temperature as a result proved to be in vain. Yes, in the tropics it proved to be less efficient than a water-cooled unit; but we hope our additional external insulation and tweaks to the refrigeration system that we have in mind for the future will keep consumption within bounds. Both units require 2 to 2.5 Amps (at 24V) to operate, and use about 25 to 30 Ah over a 24-hour period in the tropics. We have enough power-generation possibilities on board to cover the energy hungry requirements of our cooling appliances! One final comment on our fridge and freezer... Strangely enough, the lid of the freezer is only half as thick as the lid of our fridge. Funny how Hallberg-Rassy didn't put the same amount of insulation around the freezer, which has to deal with far lower temperatures and generates much higher potential heat losses!! !